100 Mile Start: 3,400 ft. Max: 5,443 ft. Total Climb: 16,779 ft.
50 Mile Start: 4,670 ft. Max: 5,443 ft. Total Climb: 6,700 ft.
50 Kilometer Start: 4,455 ft. Max: 5,210 ft. Total Climb: 3,891 ft.
30 Kilometer Start: Start: 4,630 ft. Max: 5,165 ft. Total Climb: 2,363 ft.
Friday, 9:00 AM to 9:50 AM: 100 Mile Check-in – City Park. You MUST check-in on race day so we know for sure you’re on the course!!! 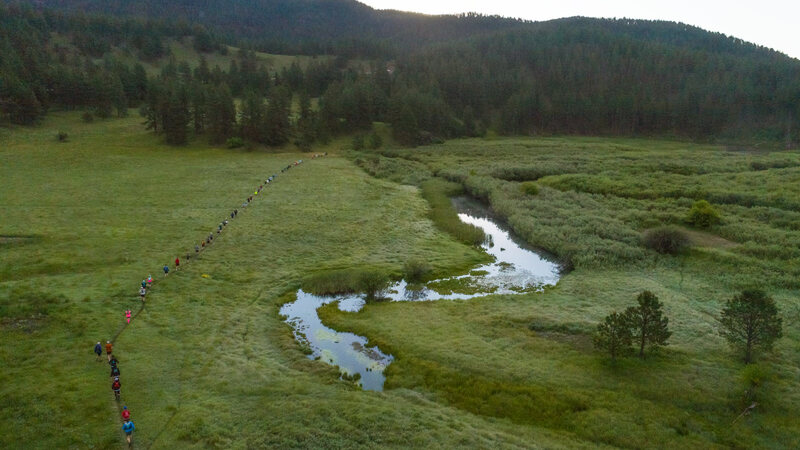 Friday, 1:00 PM to 6:00 PM: 30K/50K/50M Packet Pickup – Sturgis RV Park & Campground. *There will not be a formal pre-race meeting; if you have questions please ask at packet pickup. Saturday, 4:00 AM: 50 Mile Bus Leaves Woodle Field parking lot, adjacent to City Park. Friday, 1:00 PM to 6:00 PM: 30K/50K/50M Packet Pickup and Drop Bags – Sturgis RV Park & Campground. Saturday, 6:00 AM: 50K Bus Leaves Woodle Field parking long, adjacent to City Park. Friday, 1:00 PM to 6:00 PM: 30K/50K/50M Packet Pickup – Sturgis RV Park & Campground. Saturday, 8:00 AM: 30K Bus Leaves Woodle Field parking lot, adjacent to City Park.